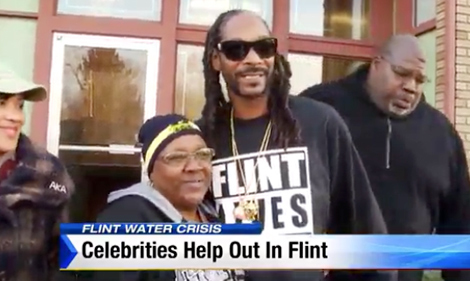 Snoop Dogg, Big Sean, Diddy, and many more are donating water and raising awareness. The current water situation in Flint, Michigan is an abhorrent tragedy where residents, including small children, have been forced to use lead-poisoned water. While the majority of signs point to political greed as the cause of the disaster (read up on it here), there is a bright spot in this whole mess: A number of celebrities, hip-hop artists in particular, have been using their wealth and power for good. Not only have the musicians and rappers been taking to their popular social media accounts to spread the word about the crisis, many have donated money or truckloads of water bottles to help out the city. A number of the musicians have traveled to Flint to lend a helping hand in person. Perhaps the most impressive donation so far has come from The Game. The rapper, who is currently on tour, took to social media to declare that he is donating $1 million worth of water bottles in partnership with Avita Water to the city because his sister and her kids live in Flint and because “he cares.” He even Instagrammed a screen shot of his bank account to prove that he personally gave $500,000 to the cause. While The Game is donating $1 million worth of bottles, Diddy and his business partner Mark Wahlberg have pledged to give one million bottles of their brand AQUAhydrate to Flint resident. The company will provide 5,000 cases of water right now and will continue to provide water until the crisis is fixed. Rapper Meek Mill also donated 60,000 bottles of water in addition to making a large donation to the Flint Child and Family Health Development fund. Because he is always beefing with some rapper, he took to Instagram and challenged 50 Cent to match his donations. Pusha T humbly jumped on the donation bandwagon as well. He sent two semi-truck trailers filled with water from Virginia to Flint to help out. Sources say that Pusha T initially didn’t want people to know that he had donated because he didn’t want the recognition. While she isn’t a rapper, soul legend Aretha Franklin, who is launching her own food line, also donated water bottles, hotel rooms, and meals to Flint residents affected by the crisis.